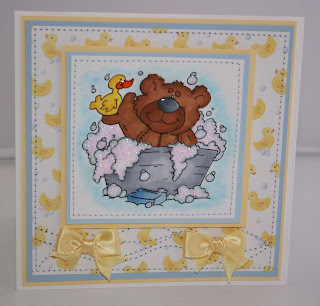 Here is a card I did with a High Hopes image. Isn't it too cute. 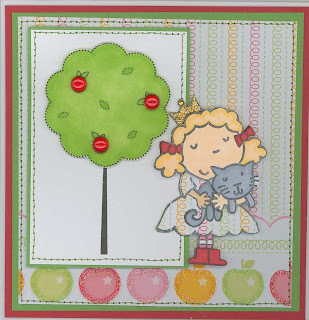 The background paper is Stampin Up. 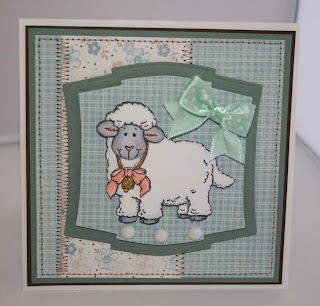 Here is another card using a Dustin Pike image... 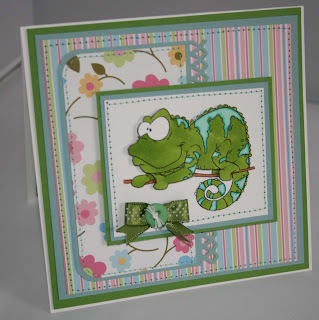 I do not design or anything for him I just love his images they make me smile. 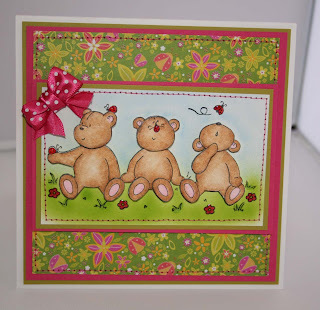 I have a couple more I will be using this week which are the little bears. This one is colored in Copics... I had some paper as you can see in my stash that matched absolutely perfectly. 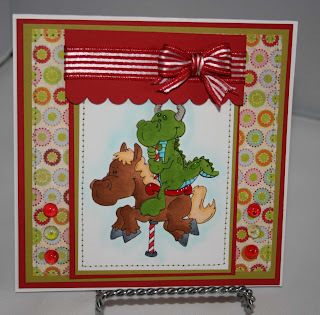 Cardstock and ribbon is Papertrey ink.... Hope everyone is having a good week. Isn't this stamp too cute. 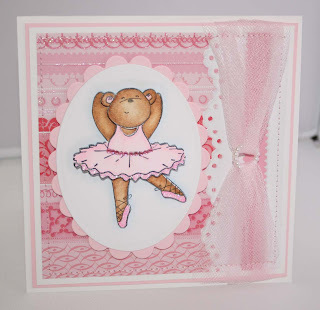 It is another one of my Sugar Nellie ones. Who can't relate to this image. What I wouldn't give to be out shopping this very moment instead of getting ready for work. 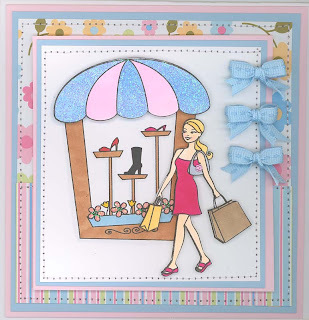 It is cold and rainy outside so definately a great day for shopping.... This was colored with copics... Have a great week. Isn't this little gal just the sweetest. Reminds me of when my daughter was little pushing her little buggy.... This is the latest release from Sugar Nellies I do believe. I colored her with Copics. 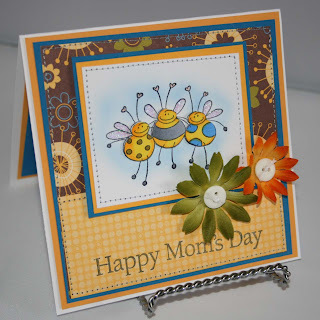 Mother's Day sentiment is from a Hero Arts Clear set and then cut it out with my nesties as I couldnt' find a punch that size.... Hope everyone has a great weekend. Here is a couple more Elzybells which were both colored with Pencils and Gamsol.... Hope everyone has a great weekend. I got my Elzybells order this yesterday.... so I made some cards with them. I tell you this week has been completely crazy. Our car broke down, dog got sick. and this morning my kitchen pipe broke so I am waiting on Roto Rooter to come over. 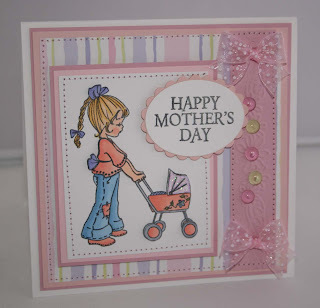 But I did make some cards yesterday. 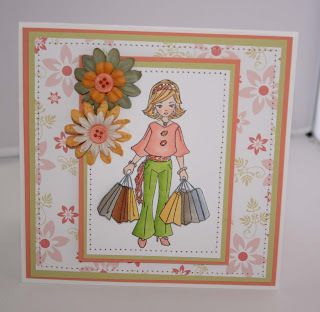 Passions for Crafts has some great Blog candy... Check it out.. Here is a sneak peak of one of the new Spiral Whispers images coming up. I believe these will be in digital format. This was colored with copics and made parts 3d. 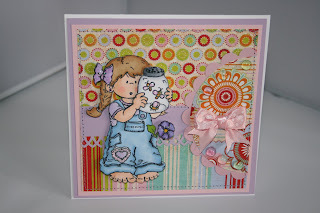 Here is a sneak peak of a new Digital stamp hitting Victoria Case's this week. I believe they are scheduled to be released on the 22nd. Isn't it too cute. He is colored in markers and made parts 3d. She is also retiring a bunch of her digital images so make sure to check it out to see if there is anything you need before they are gone. Arn't these little bees too adorable. I pulled them out for a Mother's Day card. 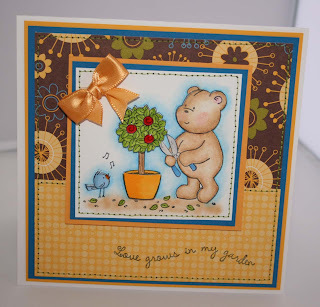 The flowers are petaloo and bottom stamp is Hero I think. I colored this in copics. Here are some more cards that I made with Dustin Pike images. 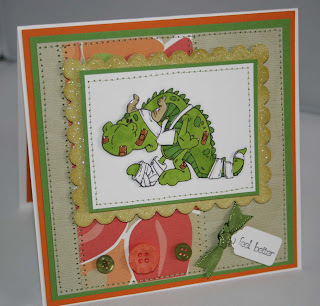 I just love those dang little dragons they are so adorable arn't they. These little animals are just too sweet too. It is starting to feel like summer here I am so glad it was in the 70's here today... I am so ready for the warm weather.. Here are a couple cards I made with Dustin Pike images. 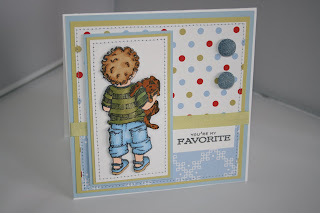 His link can be found under my digital links on the side bar... Arn't they too cute. 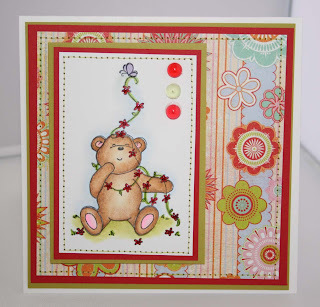 Here is a card I made with the new Victoria Case image "Spring Blooms" isn't it too cute. 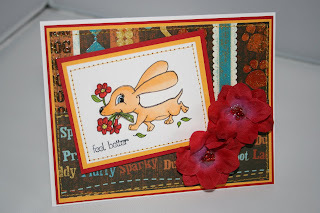 Colored with markers and then I used stickles on it and made parts 3d and the flowers are cuttlebug die. Here is a stamp from Spiral Whispers that came out a few months back. I think he is so adorable.. I did this with Copics. He can be bought on their website. 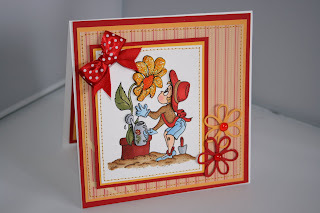 I just love these little Sugar Nellies boys they are so cute. 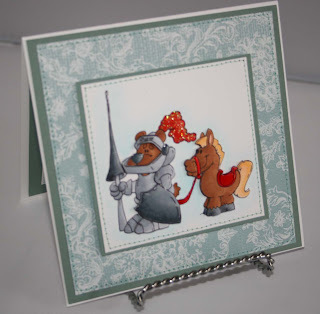 This card is done in copics and paper is Papertrey Ink and so is the saying. Hope everyone is having a great week. 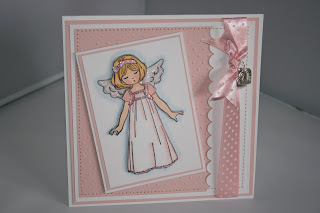 Here is another one of my new High Hope stamps. I just love this little girl. Well I was just walking out the door. Time to go to work. Only tonight and tomorrow night and my week is done until Saturday. 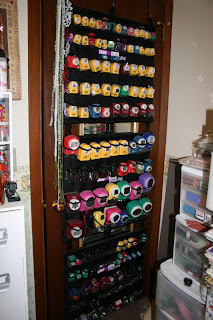 I always get messages asking me how I store my rubber stamps. 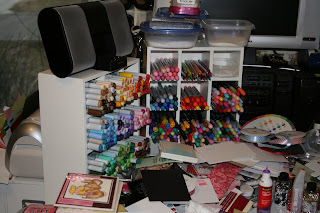 Very easy I will show you if you ignore my mess. I am in the middle of rearranging. 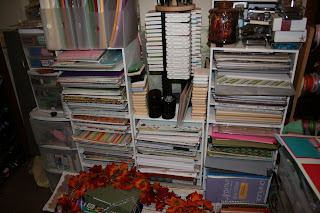 Yesterday the beige shelf you will see my rubberstamp binders on almost fell over cause it was too heavy HAHA. 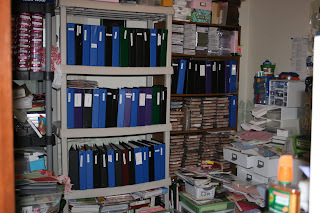 I had all my cardstock and sizziz dies on it along with a million other heavy things. Anyways so I flipped it around so it tilts now towards the wall and replaced it with my stamp binders. 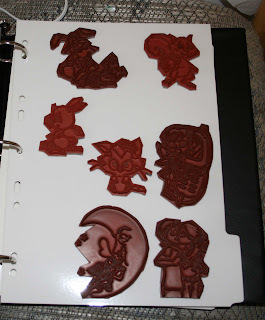 So anyways the picture with all the binders are my stamps. They are labeled by maker normally or else designer. As you can see maybe names in the single row I took. 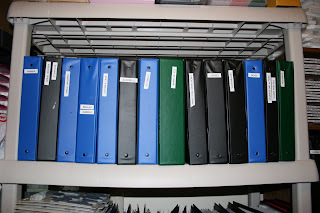 When one gets full I either get a 2 inch binder or just get another one and label it the same. 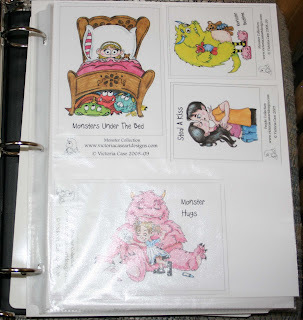 Also I use the 8 x 11 clear pages and put in either the index label that comes with which I am showing Victoria Case's now because she has the best index labels that I have seen come with stamps since they are colored. I tape them to a 8 x 11 sheet of paper and then put them in the protectors. 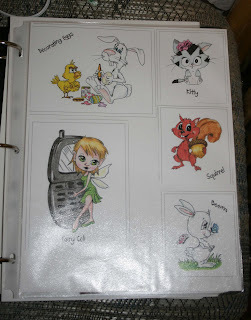 I put my stamps on ezmount and stick them to my acrylic pages see pictures you can enlarge any of them you want by clicking on them. 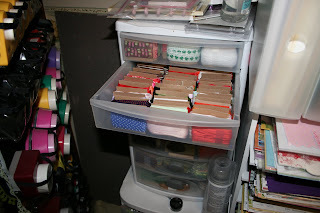 Tomorrow I will post how I store my ribbon, markers and punches. Well my eyes are still healing so I have been trying to take it easy on them. It was wierd the first day or few days I could see perfect and now I have been having difficulty focusing. From all the reading I have been doing it they say its normal and it takes a few weeks for your eyes to heal. My drivers license expired last months so I am hoping they heal very soon so I can go and get another one. 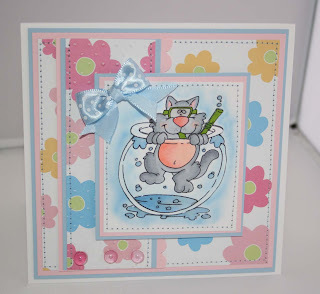 I didn't do as many cards this week as normal but did a couple. 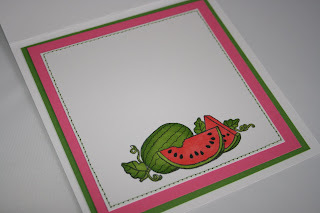 This is a Watermelon card I did from High Hopes isn't it too cute. My husband bought me a Kindle and I got it yesterday they are so cool. They are put out by Amazon. You download books straight from there also which are cheaper than paperback books and they back them up for you so they are always there.